I have to say, I was a little daunted to read a John Stott book, they all seem so weighty. And that it not to say this book is light weight, but it is very readable. Stott takes on some of the aspects of living out the Christian faith that it is very easy to ignore or let slip past us in the rush of life. Some of the chapters such as Christlikeness and Maturity I found easy to read and thought provoking. Others such as Simplicity I found… Not to simple to read. All in all, I would very much recommend is book as an opportunity to ask ourselves some awkward questions and in doing so, move closer to Christ, which is after all, the aim of the game. There is an article by Anya Briggs in September’s youth work magazine about being introverted or extroverted in youth ministry, it’s a good and balanced piece. The problem is, i find it a complicated topic. If you ask people who know me, they will tell you I am an out and out extrovert. I do display some of the traits of an extrovert mentioned in the article – I process thoughts out loud, words come quickly to me (a nice way of saying I talk lots) and I make decisions quickly. But i have learnt to my cost, that I am also introverted. Unsurprisingly when I did the questionnaire at the end of the article I came out… Bang in the middle. I really appreciated the honesty of Briggs as in the past I too have done too much and burnt out. I have finally learnt to pay attention to the introverted side of my nature. The need for time out to order the million thoughts in my head, the need for spending time alone in order to recharge my batteries, and making time for creativity and learning though study. Suddenly the love of preaching, drawing alongside and chatting to young people, book reading, art and craft, love of silence and solitude stuff all make sense. I am an extroverted introvert. No wonder Jesus has been telling me to pay attention to the things which grow my soul, in particular those things which would be classed as introverted. So what about you? Have you read the youth work magazine article? Are you introverted or extroverted or both? And what stuff in your life is Jesus calling you to pay attention to? I am finding my journey with a book of sparks to be a real encouragement. For a start, it doesn’t have a to do list at the end of each chapter, which to begin with unnerved me a little, but I have found it has caused me to engage with what is being said for longer,rather than going tick tick tick, done… and forgetting it all. The memory verse. When I read Mark 1:35, I thought, oh ok, Jesus spent time in prayer, yes, its another reminder that prayer is important. But then I stopped and read it slowly. That was when my mind opened, I could see Jesus getting up in the dark, suddenly awake with purpose, slipping out the house and receiving the solitude full of his Father, with joy. I saw the difference in pace between the disciples rushing round in excitement and the depth of Jesus time in prayer. I saw him catching them up as he says its time to go to other places… And I am in love with Jesus all over again. A relationship with creativity. What a blessing this chapter was, especially Lambert’s honesty. 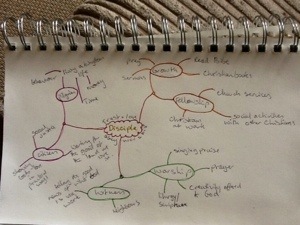 Having been a Christian youth worker for many years, I have seen how it works for church leaders. Basically, the congregation expects them to be what they are not… and as there is a lot of them, that means they want their minister to be brilliant at everything. Is it any wonder that so many are fierce in their protection of their private lives? So this sharing of what creativity means really touched me, especially as it is a subject close to my heart. I left this chapter blessed and with hope. The distortion of narcissism. This reminded me of the importance of proper accountability in our lives, having people who will tell you, in genuine love, if you are being an idiot. I look forward to the days to come with a book of sparks.